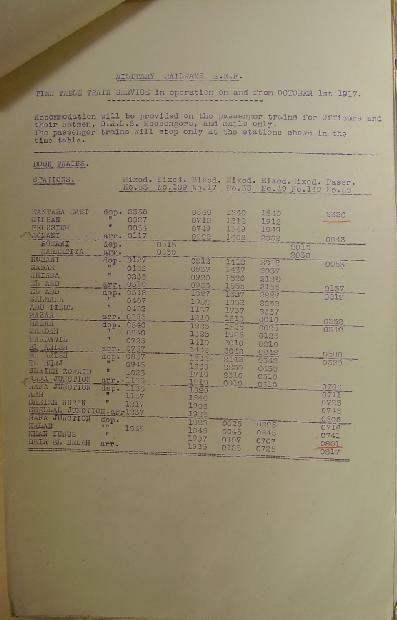 Below is the train timetable from Kantara in Egypt on the banks of the Suez Canal to the pretty little village of Deir el Belah, just south of Gaza in Palestine, effective from 1 October 1917. While it may appear superficially to be a piece of mundane memorabilia, the existence of this timetable was a crucial determinant for launching the battles at the end of October. It is by this timetable that the pace of the build-up could be measured and preparations be implemented. Kantara to Deir el Belah Train Timetable, 1 October 1917, p. 1. 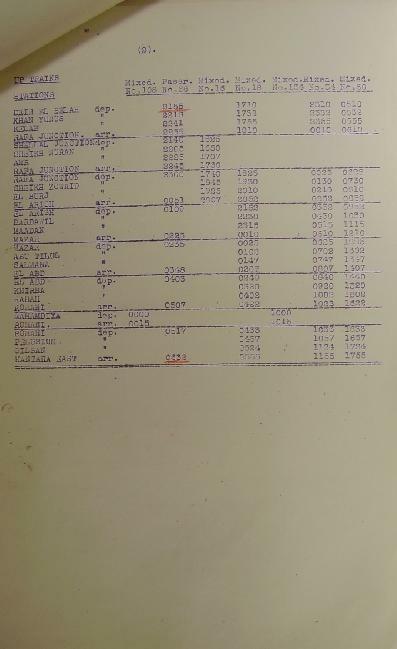 Kantara to Deir el Belah Train Timetable, 1 October 1917, p. 2. Apart from the logistics interest in establishing the lines of communication, the sidings along the way indicate locations of the Allied war effort. The railway line indicates a massive commitment to victory.